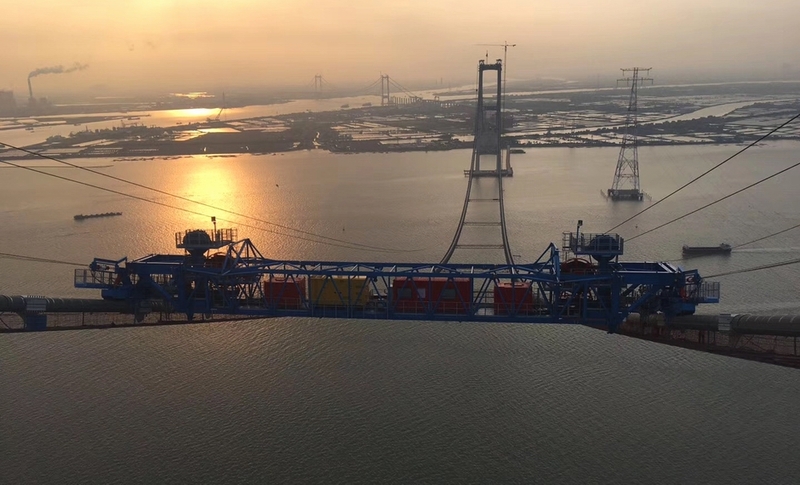 DLT were sub-contractors to Guangdong Provincial Changda Highway Engineering Co. for the design and equipment supply of three deck erection gantries and a saddle erection gantry for the installation of main cable saddles at the top of both towers and the splay pillars for the Humen II Suspension Bridge in China. 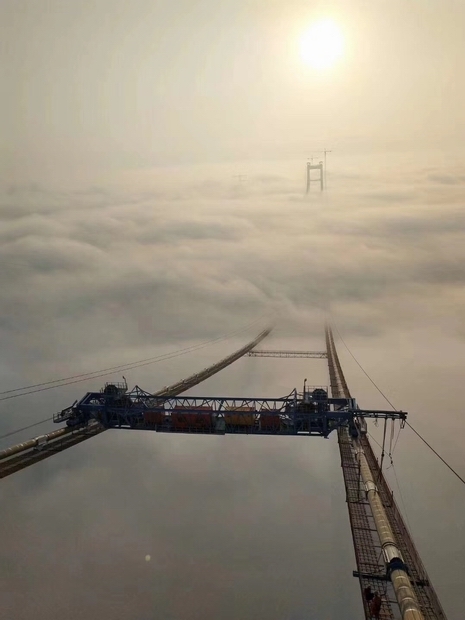 The Humen II Bridge is an asymmetrical suspension bridge with a main span of 1688m and a suspended side span of 658m. The reinforced concrete towers are 257m tall and the main cable spacing is 42.1m. The deck is an aerofoil shaped orthotropic steel box 49.7m wide and 4m deep. DLT were responsible for the concept and detailed design of the 500t SWL deck erection gantries and saddle erection gantry. The deck erection gantries were successfully overload tested to 125% of safe working load and function tested off site on a specially designed test frame in December 2017. They operated on site during the spring of 2018. The 175 deck segments were lifted into position in just 10no weeks. The Client reported that the gantry is smart and easy to operate, completing a 70m lifting cycle in 4 hours and relocation in 30min, the latter thanks to an innovative movement system which was specifically developed for this gantry. Designed for re-use on future bridges with varying cable centres and cable diameters. Modular, lightweight construction for economic transport between sites. 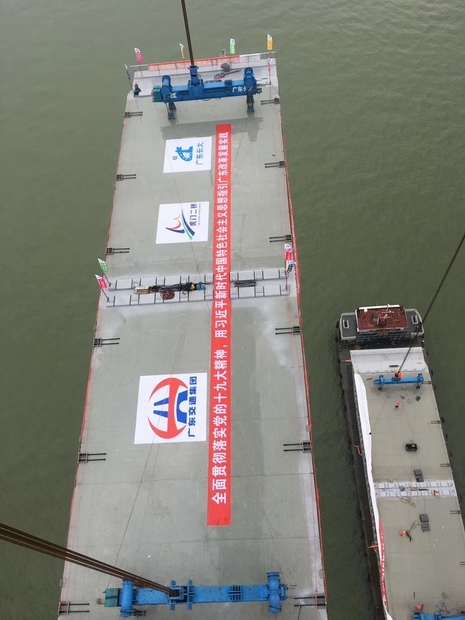 The gantry uses DLT strand jacks for deck lifting and gantry relocation for improved safety and to reduce overall gantry weight when compared to a conventional winch system. All systems centrally monitored and controlled using our DL-P40 computer control system for ease of use and for synchronisation of strand jacks during deck lifting and gantry relocation. Our strand jacks incorporate a stroke synchronised slow bleed lowering system, allowing fine adjustment of bridge deck level to within +/- 0.5mm. Wheels and ramps designed for the gantry to roll smoothly over cable bands of any length as long as the bolts are vertical. Longitudinal restraint movable brackets accommodating a large range of relative positions between the cable bands and the gantry and avoiding manhandling of heavy packing between lifting positions. Able to incline the lifting strands through an angle of up to 13 degrees to the vertical to allow deck units to be lifted away from final plan position and swung across into final position. All components weatherproof to IP55 and able to operate in temperatures down to minus 5 deg. C.